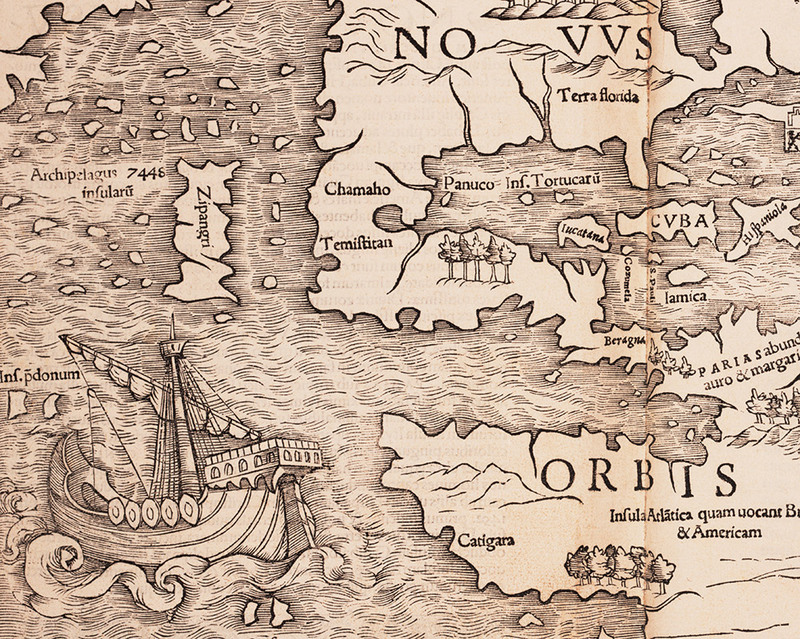 Magellan’s ship, the Victoria, in the Pacific Ocean on the map of the New World by Sebastian Münster from Geographia universalis vetus et nova. Basel, 1540. 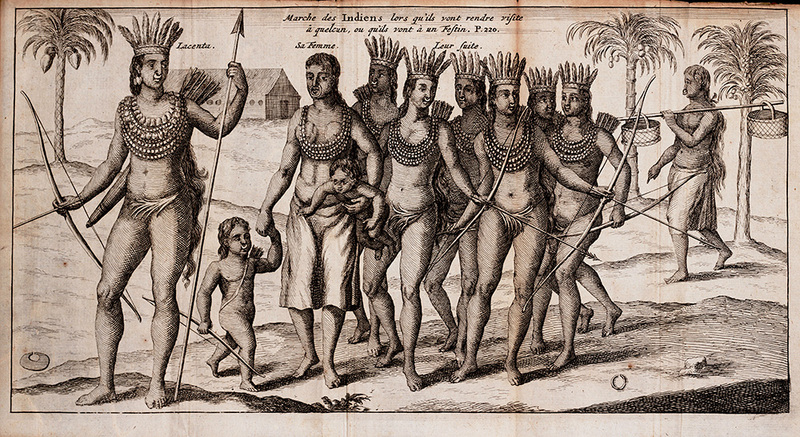 Europeans dreamed of crossing the Isthmus of Panama from their first encounters, when Columbus and other explorers learned from Native Americans about a vast open sea on the other side of the narrow strip of land. Columbus searched for a strait through which he could sail, while Balboa hiked across on foot and Magellan sailed through a strait at the tip of South America to reach the Pacific Ocean. Traveling by canoe up the Chagres River and then hiking down from the continental divide to the Pacific side became an established route for both surveyors and buccaneers. A railroad built in the middle of the nineteenth century turned a profit by transporting people on their way to California, lured by the prospect of gold. 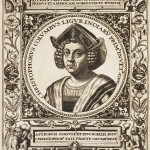 Portrait of Columbus. From J.J. Boissard, Icones…virorum illustrium. Frankfurt, 1597-99. Columbus, in his fourth and last voyage in 1502, sailed the coast of the Isthmus of Panama in search of the “narrow place between two seas” that Native Americans had described to him. He imagined a hidden strait that, of course, he failed to find. He finally departed for Spain in September 1504, getting no further in his quest of India than the coast of Panama. After sailing for some time along the shores of Panama and following the coast to the northeast, he reached the point now known as Porto Bello. 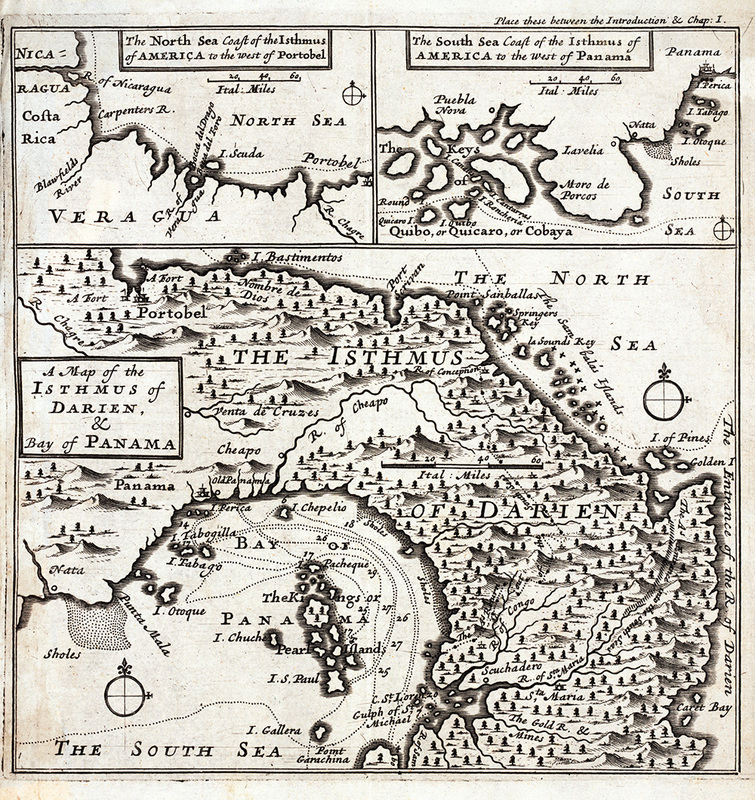 Storms along the coast of Panama forced his ships into harbors, which showed him the richness of the country, but gave no hint at how thin was the strip of country that separated him from the great ocean on the other side. 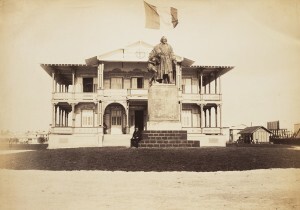 The bronze statue of Columbus, his arm around a Native American girl symbolizing America, arrived in Colón in 1870, as a gift from the Empress of France, Eugenia de Montijo. 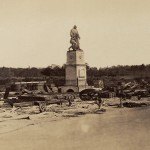 For lack of any better location, the statue ended up in a railroad yard. 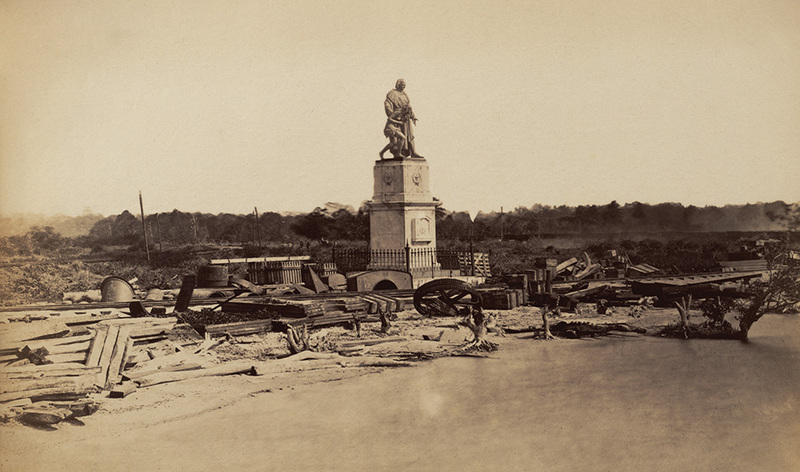 When Ferdinand de Lesseps came to Panama in 1879 to dig the ceremonial first shovelful of dirt for the canal, he requested permission to move the statue from Colón to nearby Cristóbal. It was placed in front of one of the French administrative buildings. 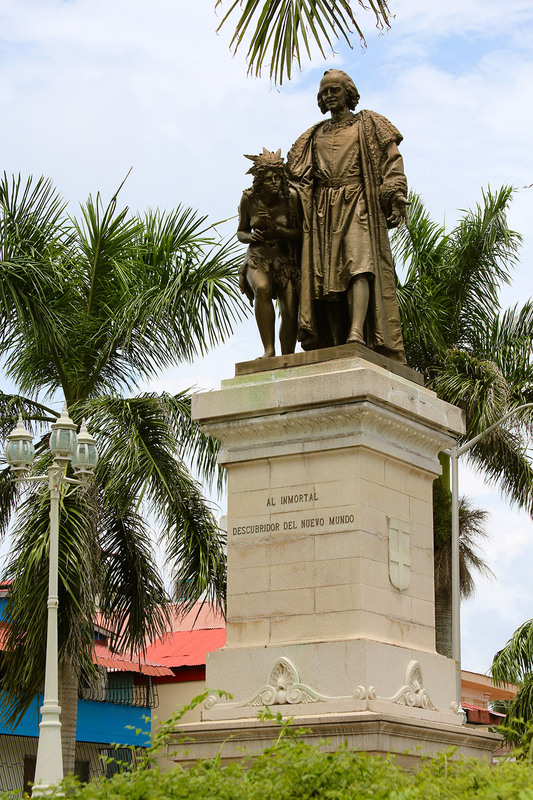 Today the statue is back in Colón, seated on a beautiful base in the Paseo Centenario. 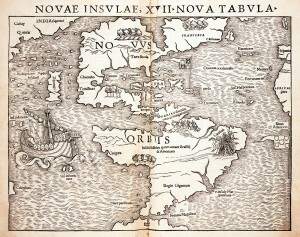 Map of the New World by Sebastian Münster from Geographia universalis vetus et nova. Basel, 1540. 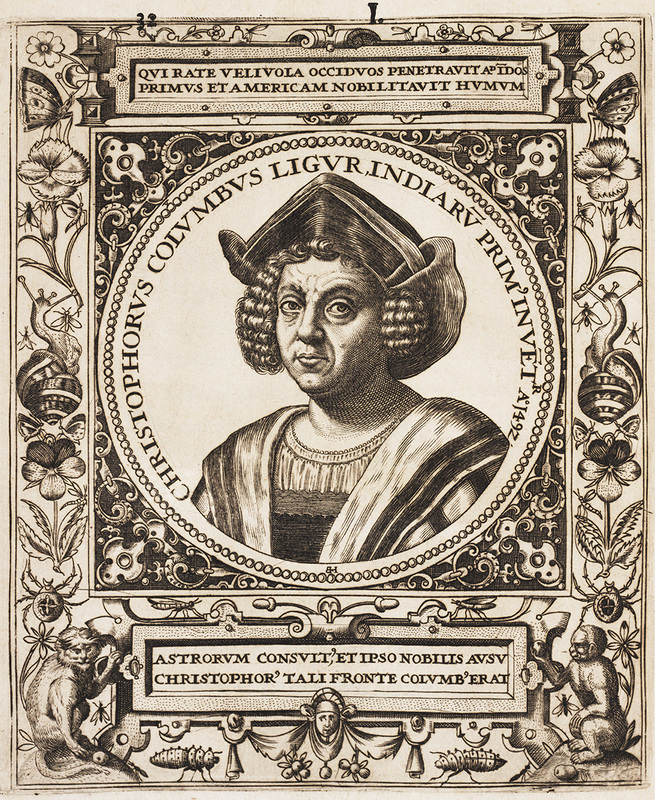 The Spanish explorer Vasco Nuñez de Balboa sighted the Pacific Ocean in 1513 from a mountain in Panama and, since he had crossed the Isthmus from north to south, called it the South Sea. Seven years later, when the Portuguese explorer Ferdinand Magellan sailed into the ocean, he found it calm and called it the Pacific Ocean. 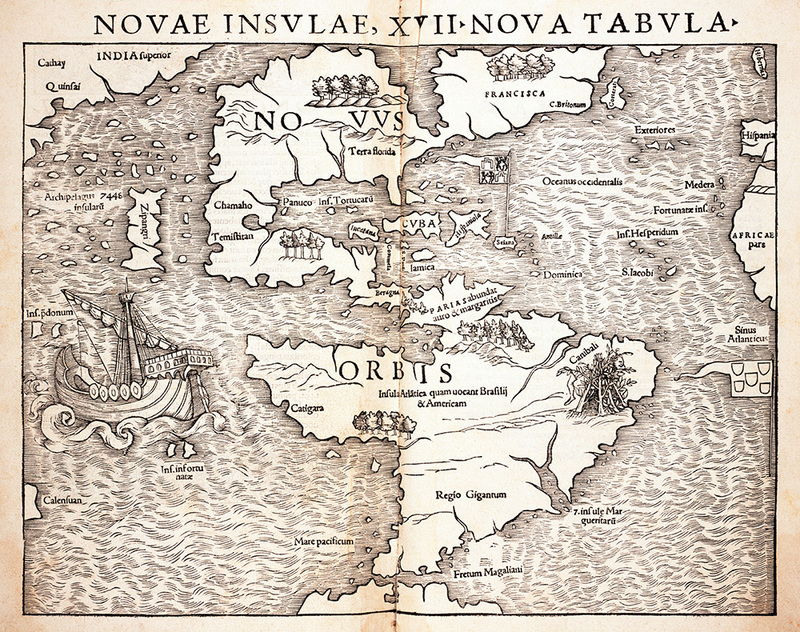 That is the name used by the mapmaker, Sebastian Münster, (1489–1552), who included an image of Magellan’s ship, Victoria, sailing in the Mare pacificam on this map of the New World. The map also shows Zipangri (Japan), which was known only from Marco Polo’s description. Map of Panama, shown as the province of Tierra Firma in 1662. From J. Blaeu, Atlas maior, siue, Cosmographia Blauiana. Amsterdam, 1662. Blaeu’s sumptuous world atlas included an entire volume on America, the New World. It includes a section on Panama, with a detailed map. Panama is called simply “Tierra Firma,” the Mainland. 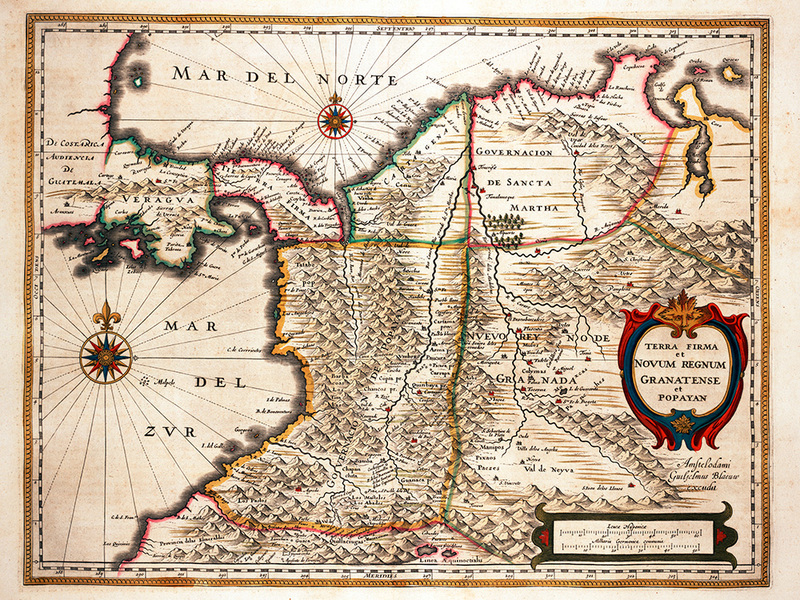 It includes features that were later significant in the building of the Panama Canal, such as the Chagres River and the city of Panama, which was already enough of an establishment to be included on this map of 1662. With two compass roses pointing north on the map, the east-west orientation of the isthmus is clearly shown. The Atlantic and Pacific Oceans are called the North Sea and the South Sea, using the names given to them by Balboa 150 years earlier. 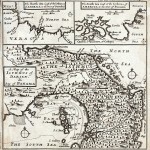 Map of the isthmus of Darien and the Bay of Panama. From W. Dampier, A New voyage round the World. London, 1697. The Indians Marching to a Feast. From L. Wafer. Voyage de Guillaume Dampier… avec le voyage de Lionel Wafer. Amsterdam, 1705. 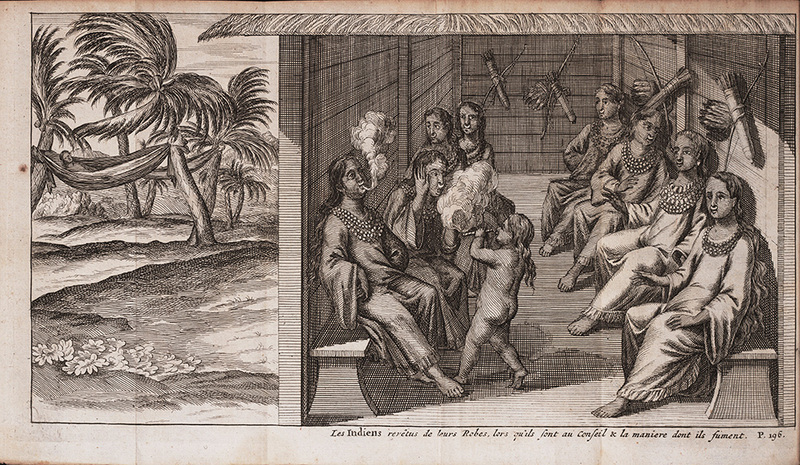 Lionel Wafer began his adventures in Central America as a surgeon, settling in Jamaica in 1677. Two years later he joined a crew of buccaneers as surgeon for the fleet, and became involved in a series of pirating ventures. While marching across the Isthmus of Panama in 1681, he was injured in a gunpowder explosion and was left to recover with the native Kuna people. He observed the people and the natural history of the isthmus and published his account of the experience. It remains one of the best early accounts of the region and its native people, giving descriptions of their culture and even a short vocabulary of their language. 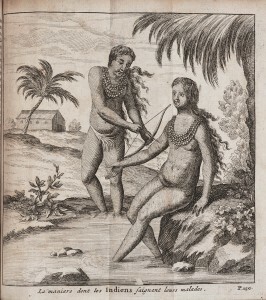 Several engravings in Wafer’s account show aspects of life among the native people. The Indians’ manner of bloodletting. From L. Wafer. Voyage de Guillaume Dampier… avec le voyage de Lionel Wafer. Amsterdam, 1705. 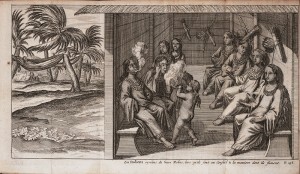 The Indians smoking tobacco in their robes in council. From L. Wafer. Voyage de Guillaume Dampier… avec le voyage de Lionel Wafer. Amsterdam, 1705. No one knows exactly where the Spanish explorer Vasco Núñez de Balboa first sighted the Pacific Ocean. Perhaps it was from Balboa Heights, the residential area overlooking the town of Balboa that serves as the Pacific entrance to the Panama Canal. Balboa Heights is where the administrative headquarters were located for the U.S.-owned Panama Canal Company. 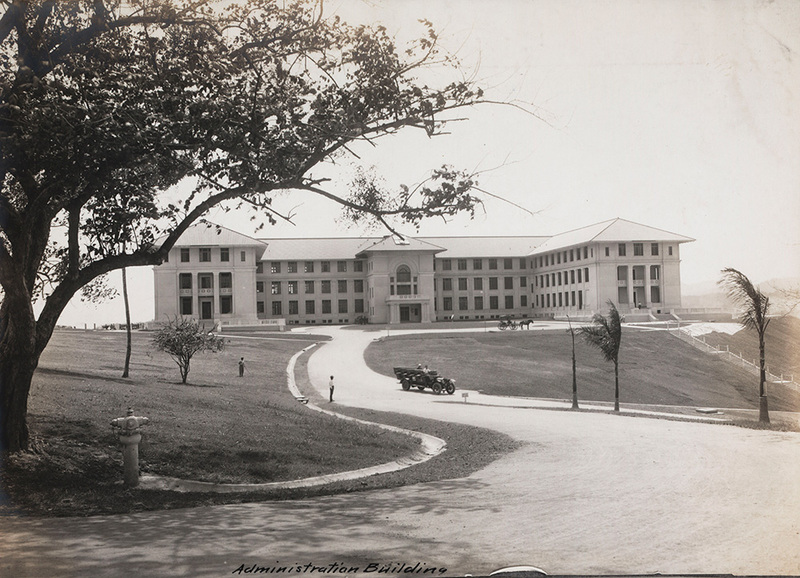 The impressive administrative building is shown as it looked during construction. 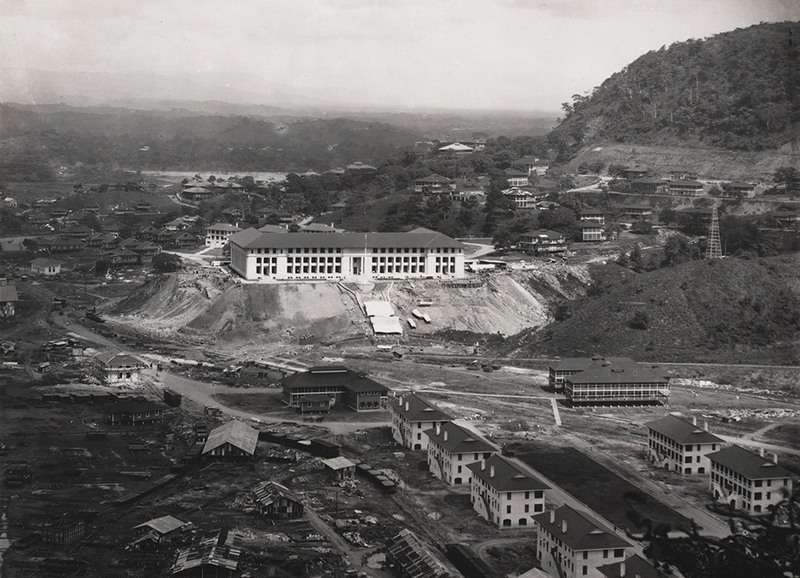 It was dedicated on July 15, 1914, exactly one month before the official Canal opening, and it continues to serve as the main administrative building for the Panama Canal Authority, the agency that now runs the Panama Canal. Perhaps with a nod to Balboa’s sighting of the Pacific Ocean, the Administrator’s office has always been located in the north wing of the second floor, overlooking the Canal’s Pacific entrance.